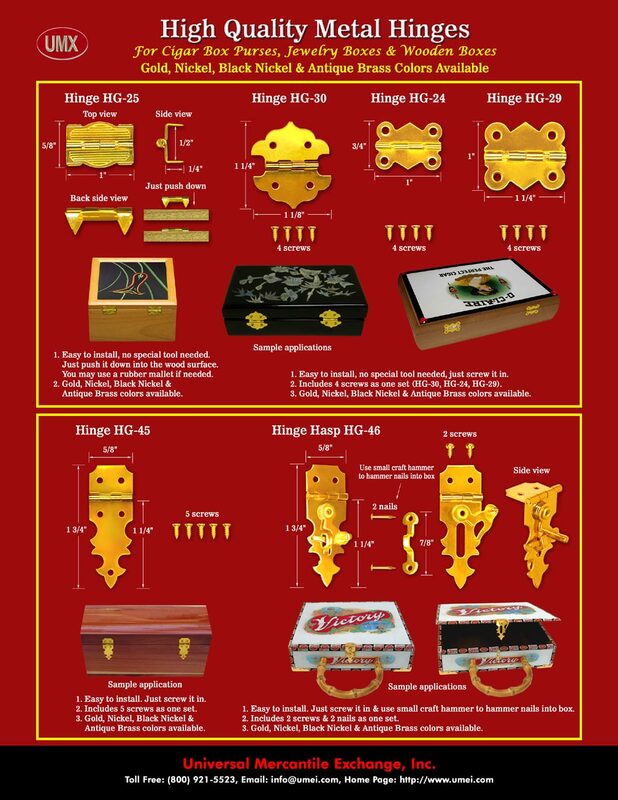 You are viewing: UMX > Handbag, Cigar Box Purse, Wooden Box, Jewelry Box > Wholesale Hinge Hardware Supplies. Hinges provide a flexible way to join or to fasten two parts together with the function of swing, turning or pivoting relative to each others. Hinge fastener hardware have a lot of different styles like wooden box hinge to join the box lid, door hinge to make the door swing, opened or closed, others like window hinge, gate hinge, cabinet hinge, drawer hinge, table hinge, furniture hinge and more. We are manufacturer, wholesaler and supplier of metal hinges for wooden boxes. Our hinges can can be used on handbag, cigar box purse, wooden box or jewelry boxes as wood box making hardware supplies. We wholesale hinges to general wholesale stores and publics at factory direct low cost. Please check our online catalogs for more wooden box hinge information. HG-25, HG-24 & HG-29, HG-30, HG-45, HG-46. You are viewing: UMX > Handbag, Cigar Box Purse, Wooden Box, Jewelry Box > Hinges: Wooden Box Hardware Supplies - Wholesale. Wholesale Hinge: Wooden Boxes Hardware Supply. We are manufacturers, wholesalers, distributors, retailers, vendors, importers, exporters and suppliers of hinge hardware supplies wholesale stores and wholesale shops.